When I went out this morning to walk Claire, I saw that the recent handful of warm days, followed by the rain, seem to have sent the cherry blossoms outside my house into an early bloom. With the morning rain still clinging to these early buds, it was a rather beautiful sight. After I'd walked Claire, I dashed back in and grabbed my 'real' camera (i.e. the less-crappy digicam, the Olympus Stylus Digital). That turned out great...Very nice. I would love to have a copy of it. 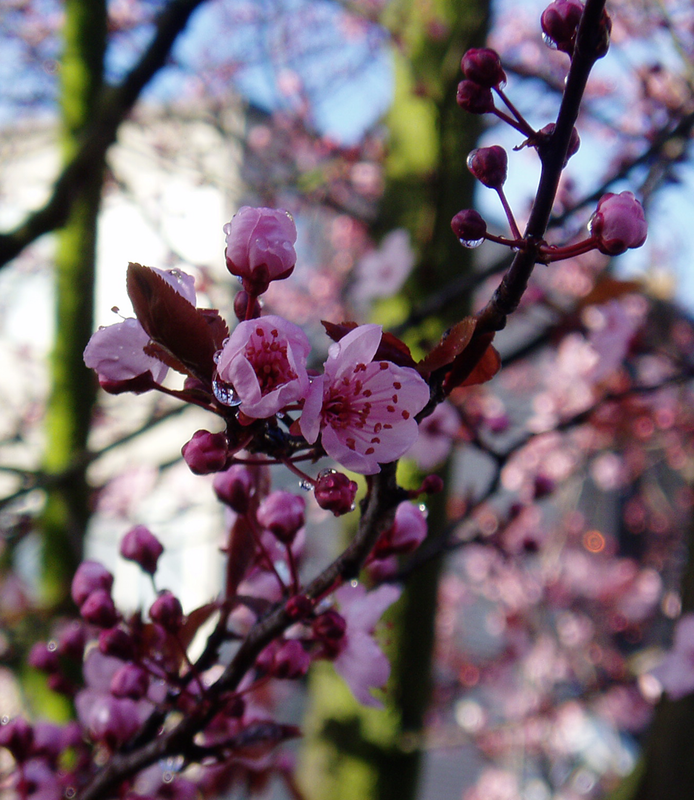 We saw cherry blossom on trees in the centre of Cambridge (the original one, in England) last weekend. It's at least two months early, and we've had no warm spell that might fool the trees. We haven't even had daffodils yet!